The aim of this survey is to find out your opinion on the teaching performance of the teaching staff in the degree you are studying, in order to help improve this performance. The data collected, as well as the reports derived from them, form part of an institutional database. The responsibility for their use corresponds to the Quality Service, which in turn is entrusted with their use and maintenance while preserving confidentiality, integrity and security. 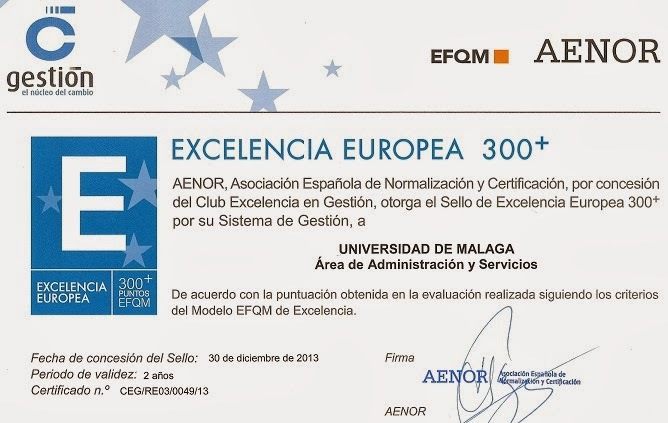 Verification of identityStatistical analysis of the resultsGeneration of global reports, for the improvement of the quality of university education.Interested parties may exercise their rights of access, rectification, cancellation and, where appropriate, opposition to the person responsible for the file (Quality Service, Strategic Planning and Social Responsibility of the University of Malaga) through the Petitions Manager Service (https://dj.uma.es/serviciocalidad/peticiones/). We thank you for your collaboration and hope that it will lead to an improvement in the quality of our university. DO YOU KNOW WHAT WE DO IN QUALITY SERVICE? Welcome to the Service of Quality, Strategic Planning and Responsibility, in these pages you will be able to find information on the activities that are developed at the moment in this Service. /cms/secciones/ajax/insertar_seccion/ /cms/secciones/ajax/borrar_seccion/ /cms/secciones/ajax/editar_seccion/ /cms/secciones/ajax/mover_seccion/ Are you sure you want to delete this section? 1083 You are about to cancel the edition. All your changes will be lost. Do you want to cancel and lost your changes?